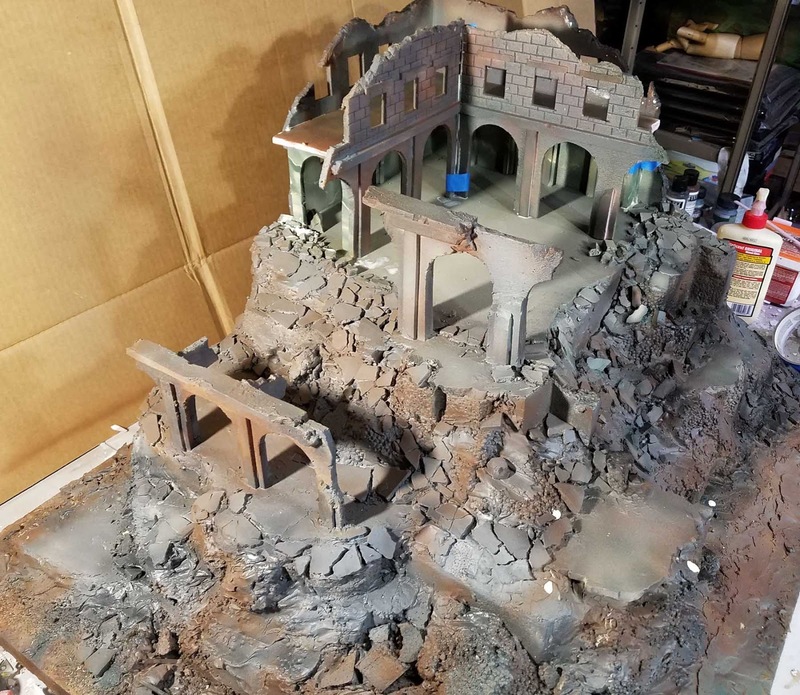 James Wappel Miniature Painting: Monte Cassino, Part 4: More Rubble! 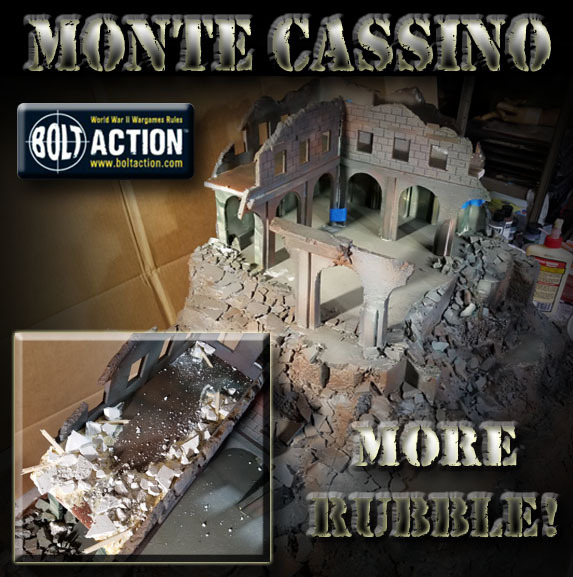 Monte Cassino, Part 4: More Rubble! The final stages of the Monte Cassino board commence. As I mentioned in a previous post, work was continuing on the figures for the army! I think you can see the familiar archways on the machine gun team's base. 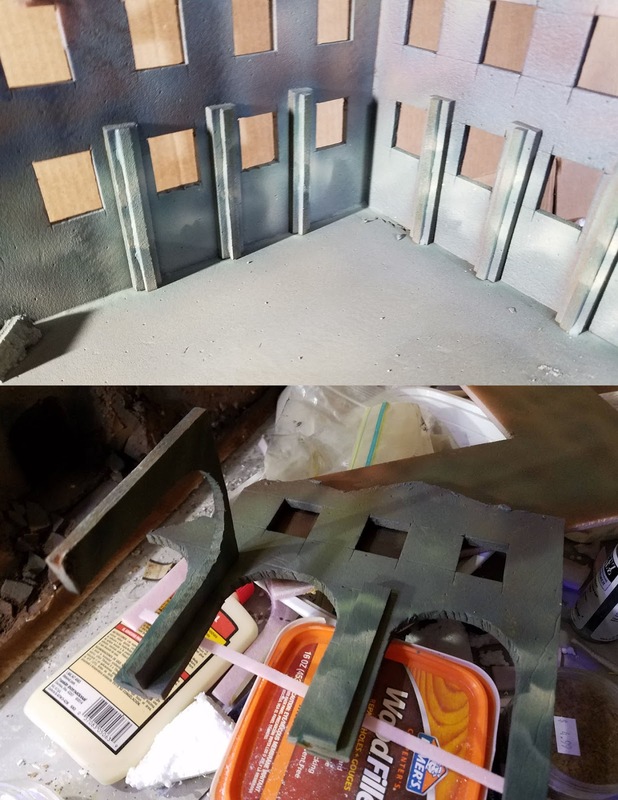 It is measured to match the arches on the display board, and I tried to keep the same colors too. 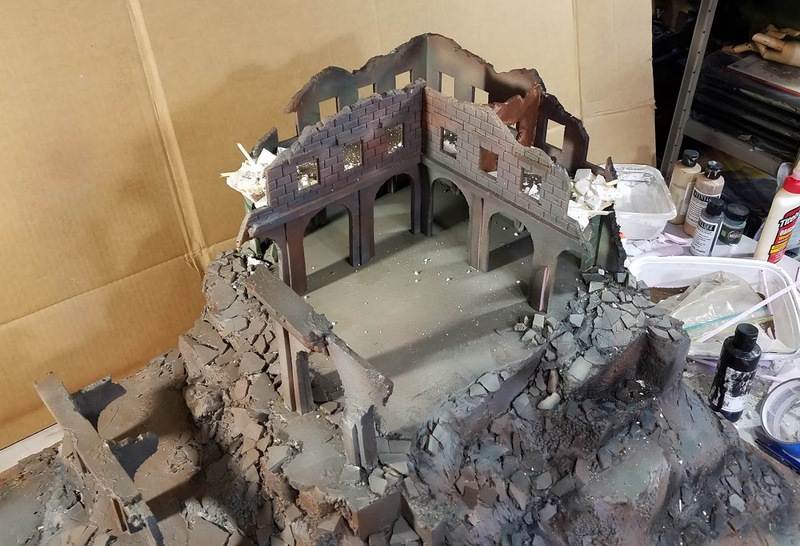 These ruins offered some unexpected benefits, such as places to store extra ammo boxes and other equipment. Using a spray bottle and some watered down glue, I put some medium and coarse gravel on the lowest layers of the board. These matched what I had been using on the bases of the figures. This is just about ready to get some paint! 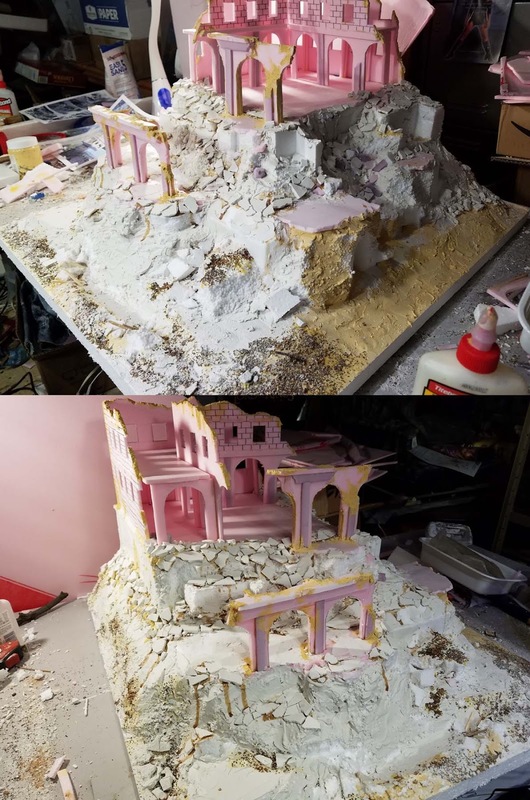 I sprayed some more of the glue water mix onto the board, so that it would sink down into the cracks and secure more of the rubble and gravel in place. 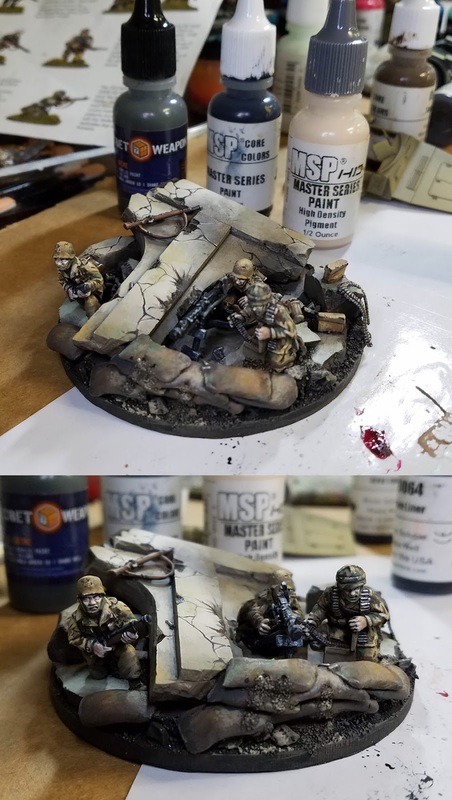 Using my Badger airbrush and a collection of Stynlrez primers, I started to get a variety of browns, tans, greens and grays to keep the color from getting too static. 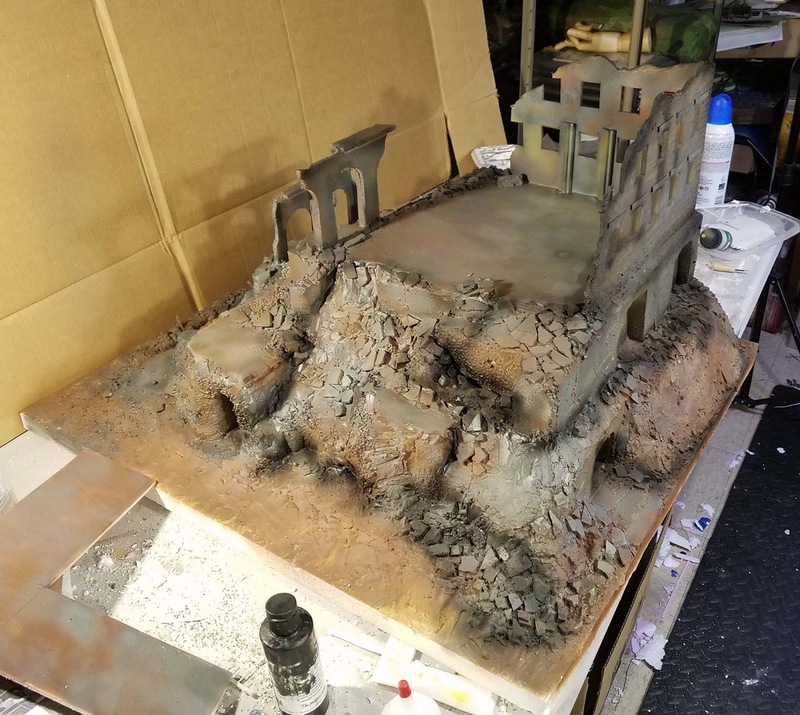 More of the reddish brown primer was used towards the base. Since I used these acrylic primers, there was no issue with 'melting' the foam with spray cans, etc. It also meant that I could be very targeted with my sprays, and get more variety of colors in the shadow areas. You will notice that the inner courtyard walls have been removed for painting. This is something that I anticipated early on, which you can see in the first few episodes. 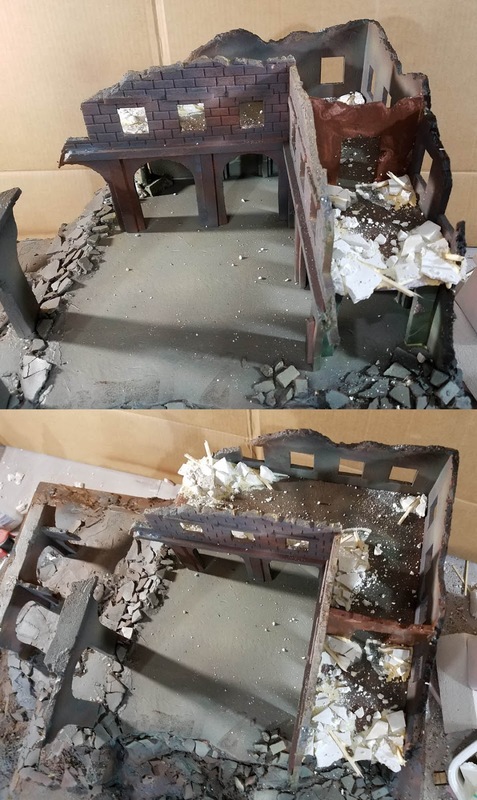 While it is not always easy working with pieces that are not completely attached, the end result made me glad that I went to that extra trouble! You can see the process of painting that interior here. 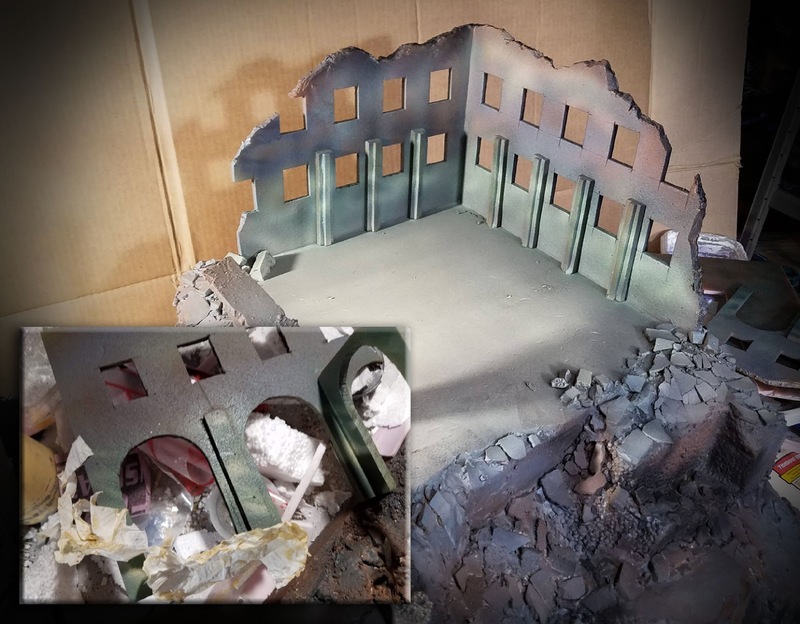 The insert shows that I did my old trick of using a torn paper towel as a mask to create some really quick marble effects. As this was all going to be in shadow, I was not worried about getting precise details. Here's a look at the interior of the walls, and the archway pieces. I think you can really see how much easier keeping that all unattached made this process! 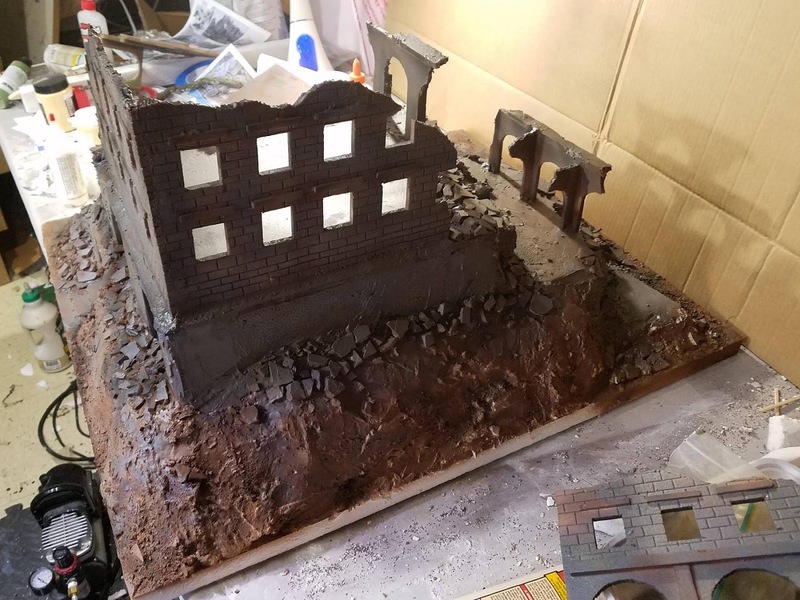 I glued all those pieces together, and got everything ready for a stage I had been looking forward to. That is, putting rubble on the upper floor of a building. This had the potential to be even more tricky than the rubble on the lower levels of the board. Many figures needed to be placed here, so that they could be easily seen. 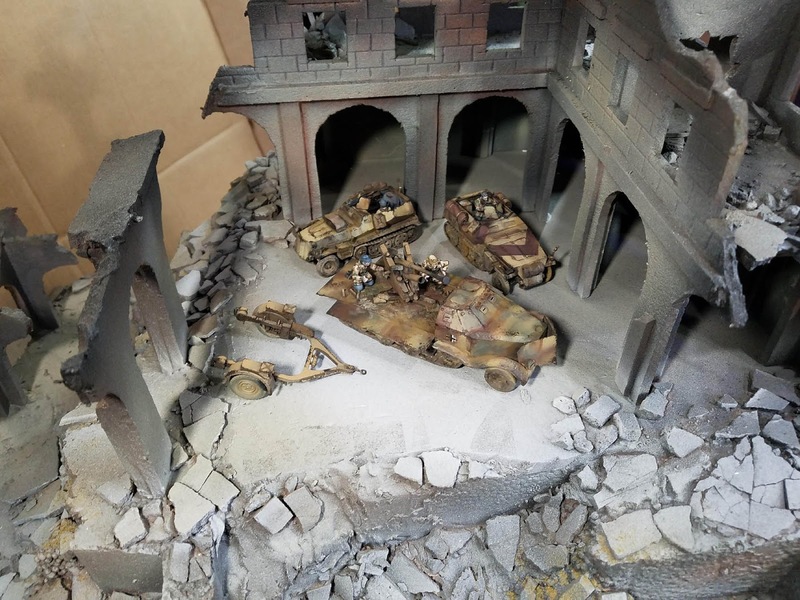 Also, this is supposed to be terrain for our games, so it is vital that figures can move around and stand there without falling over. I concentrated the bulk of the rubble towards the ends of the two openings. This would be the most visible section, and it would tie in with the rubble piles directly below. 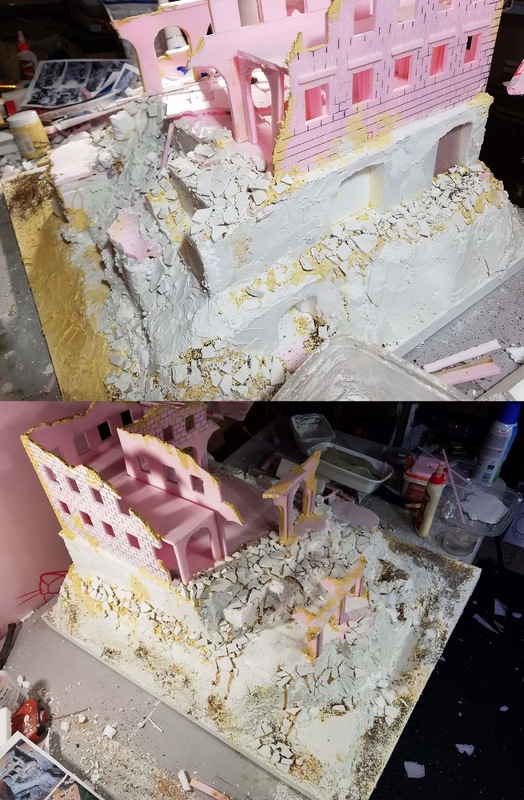 I used the same trick with the plaster as before, 'casting' a flat section of it at about 1/8 inch thick and allowing it to break up naturally. 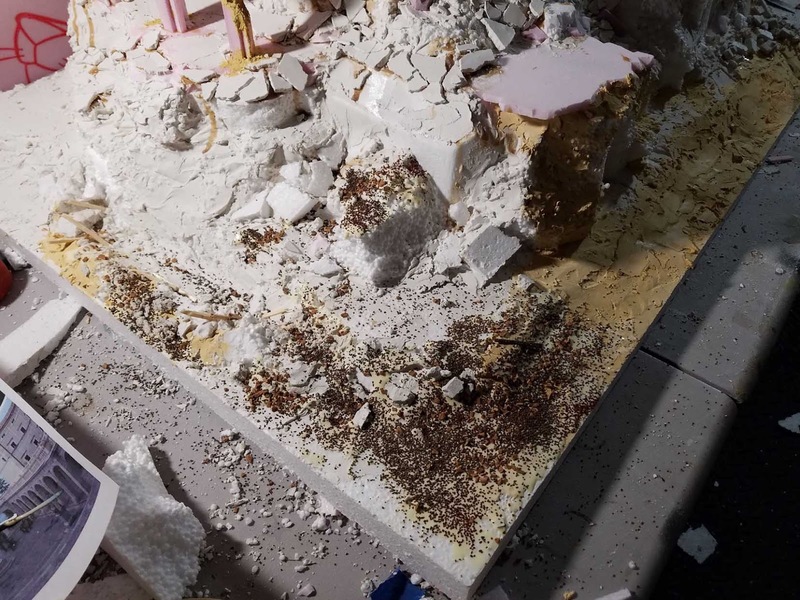 The leftover small chunks were sprinkled over some watered down glue mix that had been sprayed onto the rubble piles and floors. Once this dried, it would be ready to paint using the same Stynlrez primer and airbrush. 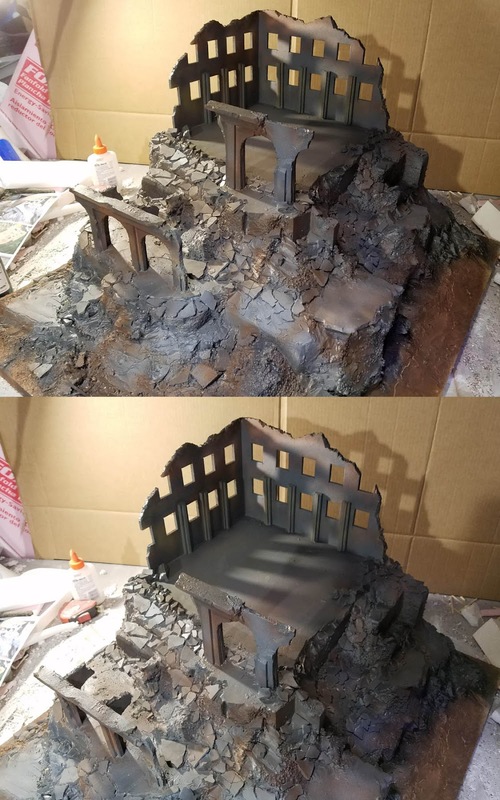 Last but not least, I had to rapidly sculpt an objective marker. Once I saw the photo of a Fallschirmjager standing next to the broken statue of St. Benedict, I had to make this. 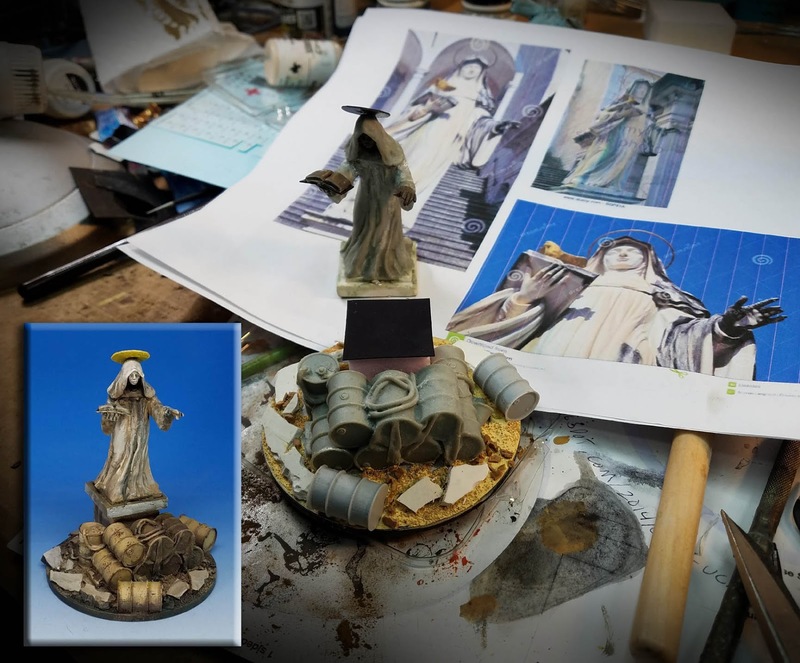 I found as many reference images as possible of the restored Madonna statue that stood opposite of the St. Benedict. I wanted to have the juxtaposition of a pile of weapons and fuel barrels stacked at her feet as she surveys the destruction and chaos all around her.